A church building damaged by Cyclone Idai in a neighbourhood in Beira, Mozambique, March, 27, 2019. Local authorities and international aid agencies struggling to deal with the massive destruction and displacement left behind by Cyclone Idai in Mozambique are facing a new crisis — cholera. Senior health official Ussene Isse told reporters Wednesday that five cases of of the water-borne disease have been discovered in a neighborhood of the coastal city of Beira, which sustained the most damage when the storm tore across Mozambique, Malawi and Zimbabwe late last week. The storm damaged the city's infrastructure, including its water supply and sanitation system. A displaced family arrives after being rescued by a boat from a flooded area of Buzi district, 200 kilometers (120 miles) outside Beira, Mozambique, on March 23, 2019. Cholera is a bacterial disease that usually comes as a result of drinking contaminated water and poor sanitation, and leads to such serious diarrhea that it can kill within hours if left untreated. Health workers are also dealing with an increasing number of people suffering from acute watery diarrhea. The World Health Organization says 900,000 oral cholera vaccines are expected to arrive in the region sometime this week. Doctors Without Borders (MSF) says it is stepping up activities to treat people with cholera and help curb the spread of the disease in the region. “MSF is already supporting the Ministry of Health to care for patients suspected to be suffering from cholera in three health centers of Beira and has so far been treating more than 200 patients a day. In the coming days, we will work alongside the Ministry of Health to scale up as much as possible and provide support to more cholera treatment units as well as work to rehabilitate a larger cholera treatment center," a Doctors Without Borders statement said. United Nations Secretary-General António Guterres said Tuesday that the international community needs to quickly step up funding to assist the three southern African nations that have been devastated by Cyclone Idai. “Tropical Cyclone Idai delivered a direct, one-two punch of wind and flooding across a vast area long experiencing poverty and drought,” Guterres said of the storm which slammed areas of Mozambique, Zimbabwe and Malawi. FILE - U.N. Secretary-General Antonio Guterres speaks at the U.N. headquarters. On Monday, the U.N. appealed for nearly $282 million to cover immediate needs for the next three months in Mozambique, which was hardest hit. 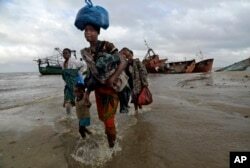 “We fear that whole villages have been washed away in places we have yet to reach,” Guterres told reporters. Appeals for Malawi and Zimbabwe will be made in the coming days. “I call on the international community to fund these appeals quickly and fully so that aid agencies can urgently ramp up their responses,” the secretary-general said. Members of a church salvages bricks from a damaged church building in Beira, Mozambique, Monday, March 25, 2019. The United Nations is making an emergency appeal for $282 million for the next three months to help Mozambique start recovering from the devastation of Cyclone Idai. The cyclone's heavy winds and rains killed at least 750 people in Mozambique and neighboring Malawi and Zimbabwe, and made hundreds of thousands of people homeless. 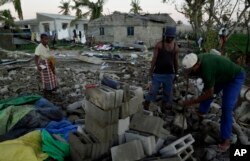 The death toll in Mozambique itself has risen to 468 people. The U.N. and partner agencies have been on the ground assisting affected communities. “Under extremely difficult conditions, we have been air-dropping emergency kits that contain food, medicine, water purification gear, and shelter to communities that are still stranded by the flood waters,” Guterres said. The U.N. and its agencies say they have already reached 100,000 people with food aid and are scaling up to reach many more. David Beasley, the head of the World Food Program, is on his way to Mozambique. Humanitarians are also working to prevent the spread of potentially deadly diseases such as cholera and malaria, which thrive on stagnant waters and poor hygiene. 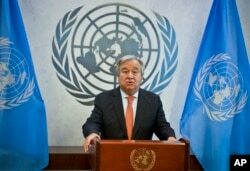 Guterres said there are reports that $1 billion in infrastructure has been destroyed. Guterres noted that such catastrophic weather events are becoming more common due to climate change and they will only get worse if the world does not act now. The International Federation of Red Cross and Red Crescent Societies has also launched an appeal for $30.5 million to provide life-saving aid for 200,000 of the most vulnerable survivors in Mozambique. And the U.S. Department of Defense said it will provide $6.5 million in immediate humanitarian assistance to Mozambique.